Everyone gathers in the kitchen, and in this busy family’s home, everything seemed to gather on the kitchen desk. Aby Garvey helped this family turn counter-top chaos into a high-function command center. You can read more from Better Homes and Gardens® Magazine here. Big cleaning projects can be intimidating. But rather than waiting until you finally clear a huge block of time to tackle the whole thing, Aby suggests this simple six-step process for tackling big cleaning projects little by little. Five Fantastic Tips for Making Cleaning FUN! Like it or not, housework must be done. In this online article, Aby shares five ideas to take the dread out of cleaning day. Aby offers a simple step-by-step method for creating a realistic cleaning schedule that works for you! In the article “Sanity Savers,” Aby shares time management and holiday organizing tips to help readers have a happy and fulfilling holiday season. 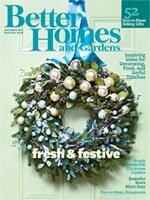 See page 70 of the December 2012 issue of Better Homes and Gardens. 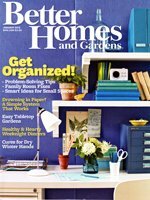 Aby is a featured organizing expert in the January 2012 issue of Better Homes and Gardens in the article called “In-Box RX.” See page 38. Aby provided complete instructions for setting up a household reference binder through a download available on the Better Homes and Gardens website. 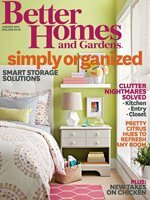 Aby is a featured organizing expert in the January 2011 issue of Better Homes and Gardens® Magazine in the article called “25 Ways to Declutter for the New Year.” See pages 39 and 40.